Apple and Dropbox have joined the Electronic Frontier Foundation (EFF) in taking a stand for user privacy. In other words, they will not hand over your private files to the Feds if asked--they'll only hand them over if presented with a search warrant. 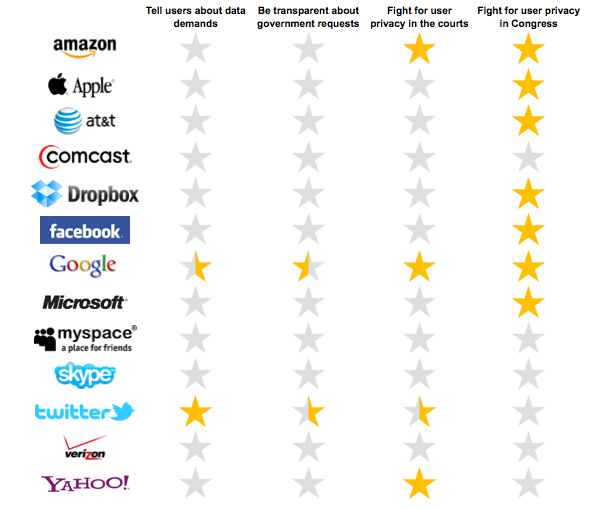 Back in April, the EFF, a privacy watchdog group, sent out a "Who Has Your Back?" call-to-action to 13 major companies, including Apple, Amazon, Facebook, AT&T, Google, Microsoft, and Dropbox. The foundation asked the companies to join the fight for user privacy in Congress--hence the title, "Who Has Your Back?" Well, apparently both Apple and Dropbox do, because they have agreed to fight for user privacy in Congress, and have each earned a gold star from the EFF for doing so. Presumably, this means both companies will require search warrants from government officials before handing over users' private files and data. It also (hopefully) means that both companies will work to ensure that any private user info the government requests is relevant to the case at hand. The companies have joined the Digital Due Process (DDP) coalition, which is a coalition of privacy advocates, including the EFF, ACLU, and the Center for Democracy and Technology. Other companies in the coalition--who, subsequently, "have your back"--are Amazon, AT&T, Facebook, Google, and Microsoft. The coalition seeks to modernize surveillance laws for the Internet age, and is currently trying to get Congress to update the Electronic Communications Privacy Act (ECPA). "ECPA was passed by Congress in 1986, before the World Wide Web was even invented and when cell phones were still a rarity. Yet to this day, ECPA is the primary law governing how and when law enforcement can access personal information and private communications stored by communications providers like Google, Facebook, your cell phone company or your ISP." The EFF believes the ECPA needs to be updated to address location information (for example, whether the government needs a warrant to track your cell phone), privacy of emails and other communications, and privacy of search history. Since the DDP launched last spring, Congress has held five hearings on the issue and has introduced several bills that address some of the coalition's recommendations--including a "GPS" act that would require law enforcement get a search warrant before obtaining geolocation information using a cell phone or a GPS tracking device.